VATICAN CITY (CNS) — The bishops of East Africa praised the peace efforts that brought an end to the two-decade war between Eritrea and Ethiopia. “As this process of reconciliation continues, the Catholic Church urges the stakeholders to ensure that justice and peace are restored and let the peoples of these countries be involved in the process, their voices heard and captives returned to their families,” the bishops said. “The Catholic Church in both countries had been raising their voice to denounce the fraternal conflict and war, prayed together and gave hope to the people throughout by remaining firm to solve the situation peacefully and showing solidarity with the peoples of both countries,” the statement said. An estimated 80,000 people are believed to have been killed between 1998-2000 during a fierce border conflict. However, after the two countries signed a U.N.-brokered border agreement in 2000, they failed to implement it. 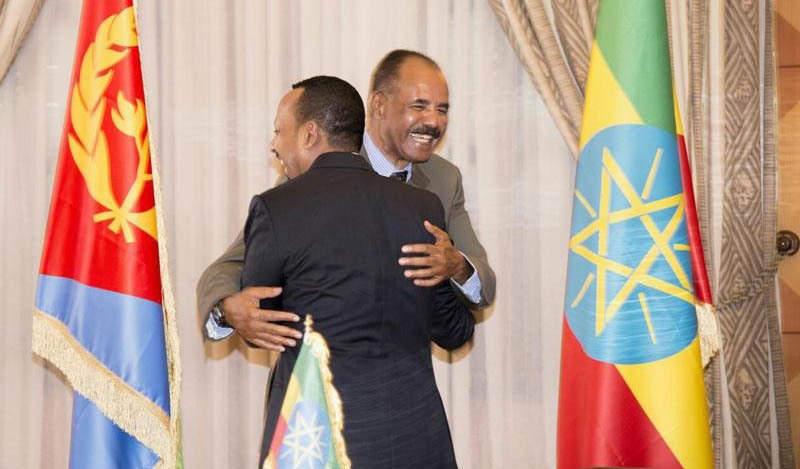 Ethiopian Prime Minister Abiy Ahmed and Eritrean President Isaias Afwerki signed the peace pact in the Eritrean capital, Asmara, July 9.